Make time for a quick surf getaway in the beautiful, warm waters of Jaco, Costa Rica! Bob Marley Jaco Surf School offers the perfect two-day package that will leave you wanting more! In this camp, you will enjoy a two-hour surf lesson with an experienced, certified, and licensed instructor. You will be staying in a hotel right on the beach and before or after your lesson, you will be able to enjoy hiking, lounging on the beach, an outdoor restaurant/bar/shower, and pool. 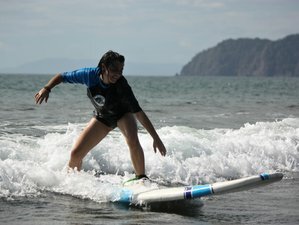 So join this surf camp in Costa Rica and get ready to create some amazing memories! This special package includes a private room in South Beach Hotel surrounded by tropical gardens only a few steps away from the beach, pool, outdoor bar/restaurant, and outdoor showers. There are two room types (Deluxe and Standard) both of which feature Wi-Fi, AC, Shower/Toilet, Hot Water, comfortable sleeping area, Cable/Satellite TV, Ceiling Fan, Safe, and Work desk. You'll have plenty of time to add in extra excursions on your 2-day getaway. Highly recommended is the SUP tour along Jaco Beach and a hike up Miro's Mountain nearby where you'll climb quickly and capture some picturesque views of Jaco Beach - and be on the lookout for beautiful flora and fauna - iguanas, butterflies, and monkeys! Cali loves the ocean and has over 20 years of experience in surfing and paddleboarding. He is an ISA-licensed and CPR / lifeguard certified and enjoys working with all levels of surfers (beginner, intermediate, and advanced) and all ages (5 - 77). Cali and the other Bob Marley Jaco Surf School instructors create a relaxed, fun, truly enjoyable atmosphere for all students in inviting tropical waters. There is also plenty to do for family and friends who don't surf - lounging on the beach, outdoor restaurant/bar, outdoor pool, tours, excursions, and shopping. Bob Marley Jaco Surf School is located on the beach in Jaco, Costa Rica. You will be within a 2 minute cab ride, 5 minute bike ride, and 10 minute walk to the main street which runs parallel (and only 1 block) to the beach. Jaco town offers numerous restaurants, bakeries, coffee shops, boutique shops, souvenir shops, banks, gyms, and grocery stores. You'll be offered fresh fruit snacks and water in this camp. Delicious food is available all day, but not included in the price. After you've worked up an appetite, simply walk a few steps to the bar and restaurant. South Beach hotel offers dining all day long - and the food is fresh and fantastic. If you do choose to venture out, Jaco main street is only a few minutes away and has numerous restaurants for every taste and budget. Massage and Spa Treatments are available at one of the local Spas or in-room for an additional charge. Prices generally range from 40-55 USD per hour. Please book your flight to arrive at San Juan Santamaria International airport (SJO). Transfer from and to the airport is not included, but available for an additional charge. Airport: Juan Santamaría International Airport Airport transfer available: Juan Santamaría International Airport (US$90 per person) Additional charges may apply. You can request this in the next step. Bob Marley Jaco offers Surf/SUP/Kayak lessons, rentals, tours & complete vacation packages in Costa Rica. Certified, licensed instructors. Book your stay today!